Our Full Course Dialysis Nurse Training Program consists of both theoretical/classroom and hands-­on/practical training in all phases of the hemodialysis process. All medical professionals and staff who complete this training course are fully capable of caring for and managing their patients throughout the entire hemodialysis process. Each trainee is assigned to a preceptor (usually a senior staff nurse) on a one-on-one basis. The preceptor will guide and mentor him for the entire duration of the training period. Facilitates the development of the skills and competence of the trainee as a dialysis nurse. Imparts first­hand knowledge gained from experience to their assigned trainees. Ably mentor the assigned trainee without the direct supervision of the head nurse. Adheres to the prescribed modules of the training program. Continuously upgrades own skills and competence by participating in learning and practice conferences designed for medical professionals in this field of specialization. Assists nurse trainees, as needed, in planning and implementing assigned tasks. Provides helpful feedback to assigned nurse trainees. Required module for mastery of clinical skills. A course on repair & maintenance of hospital equipment with emphasis on dialysis machines. 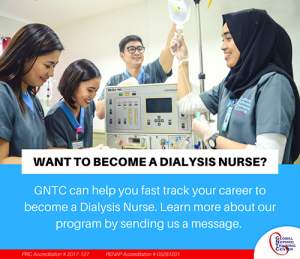 The certification program designed for entry level nurses who aspires to specialize in the hemodialysis arm of the nephrology nursing field. The course will provide foundations for nephrology nursing including, but not limited to, anatomy and physiology of the renal system, renal replacement therapies and its principles and nursing process involved in caring for the renal patient. The course will also provide clinical hands-on experience to allow them to develop skills necessary to the practice. The course is offered to promote awareness that there is a growing need for trained and competent hemodialysis nurses in the country. A standardized curriculum partnered with standardized actual practice is essential to bring forward nurses who are globally competent and able to professionally care to renal client needs. The certification program is designed for college level and/or college graduates who aspires to learn and understand basic to advanced knowledge in Hemodialysis treatment and Chronic Kidney Disease patient care. The program is structured to provide two training Phases: Theoretical Phase and Clinical Exposure Phase. The coursework would include, but not be limited to, the following topics: 1) Renal Anatomy and Physiology, 2) General Patient Care Procedures, 3) Hemodialysis, its principles and components, 4) Vascular Access, 5) Managing the Hemodialysis Unit and Personnel. The program is offered to promote awareness that there is a growing need for trained and competent Hemodialysis-specific Patient Care Technicians ready to start a career in the United States of America. A standardized curriculum patterned with standardized actual practice is essential to bring forward HPCTs who are able to function within the Hemodialysis care team and to promote holistic and quality care to renal patients. Hemodialysis Nurse Aide assists Dialysis Professionals in the performance of their technical duties involving non-direct patient care.